The Production Tax Credit (PTC) is a federal incentive that provides financial support for the development of renewable energy facilities. Companies that generate electricity from wind, geothermal, and “closed-loop” bioenergy (using dedicated energy crops) are eligible for a federal PTC, which provides a 2.3-cent per kilowatt-hour (kWh) incentive for the first ten years of a renewable energy facility's operation. Other technologies, such as "open-loop" biomass (using farm and forest wastes rather than dedicated energy crops), efficiency upgrades and capacity additions at existing hydroelectric facilities, small irrigation systems, landfill gas, and municipal solid waste (MSW), receive a lesser value tax credit of 1.1 cents per kWh. The PTC for wind and other renewable energy technologies expired at the end of 2013. On December 17, 2014 Congress passed a tax extenders bill that retroactively extended the PTC for projects that were under construction by the end of 2014. By effectively extending the credit for only two weeks, Congress is not providing the certainty the renewable energy industry needs to develop projects, secure financing, and sign power purchase agreements, which can often take up to two years or more. Between 2007 and 2014, U.S. wind capacity has nearly quadrupled, representing an annual average investment of nearly $15 billion. More than 550 manufacturing facilities located in 43 states produce 70 percent of the wind turbines and components installed in the United States, up from 20 percent in 2006 – 2007. The cost of generating electricity from wind has fallen by more than 40 percent over the past three years. But Congress has repeatedly gone back and forth between expiring and extending the PTC, which has wreaked havoc on the wind industry. Originally enacted as part of the Energy Policy Act of 1992, Congress has extended the provision six times and has allowed it to expire on six occasions. This "on-again/off-again" status has resulted in a boom-bust cycle of development. In the years following expiration, installations dropped between 76 and 93 percent, with corresponding job losses (see Figure below). The cycle begins with the industry experiencing strong growth in development around the country while the PTC is firmly in place, and in the years leading up to the PTC's expiration. Lapses in the PTC then cause a dramatic slowdown in the implementation of planned wind projects and layoffs at wind companies and manufacturing facilities. 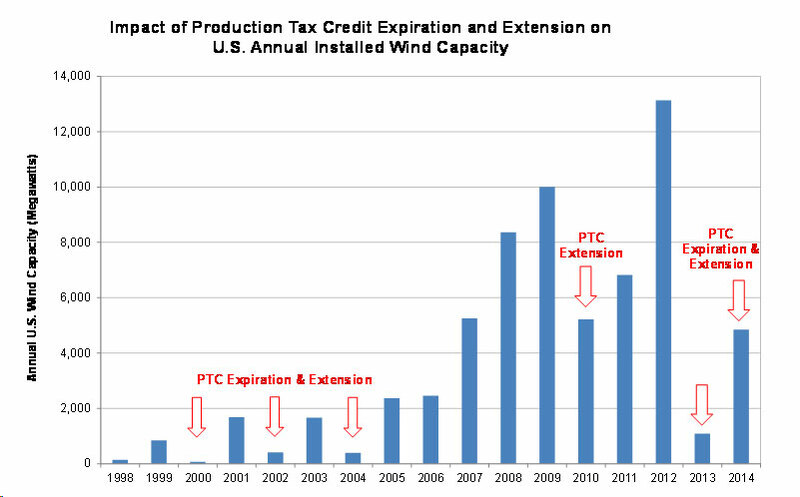 Upon restoration, the wind power industry takes time to regain its footing, and then experiences strong growth until the tax credits expire. And so on. Short-term extensions of the PTC are insufficient for sustaining the long-term growth of renewable energy. The planning and permitting process for new wind facilities can take up to two years or longer to complete. As a result, many renewable energy developers that depend on the PTC to improve a facility's cost effectiveness may hesitate to start a new project due to the uncertainty that the credit will still be available to them when the project is completed. Last-minute PTC extensions don’t serve anyone well either. The pending uncertainty threatens access to financing and stalls plans for development, jeopardizing the tens of thousands of jobs in the industry. This uncertainty was clearly evident in 2013 when the PTC was extended two days after the 2012 expiration date and U.S. wind development hit its lowest level since 2004. However, a recent study by the American Wind Energy Association (AWEA) shows that more than 12,700 MW of wind capacity was under construction in 22 states at the beginning of 2015, and more than 3,300 MW of capacity has signed power purchase agreements since the beginning of 2014 that could be eligible for the PTC under the IRS under-construction guidelines. Strong long-term policy support is essential to ensure the continued growth of the renewable energy industry in the United States. A long-term extension of the PTC would bring more stability to the industry, and help level the playing field with fossil fuels and nuclear power—industries that have received far greater taxpayer support for decades. But most importantly, the PTC works. With it in place, wind power has dramatically increased, reducing our reliance on fossil fuels, driving innovation and economic development, lowering costs, and providing important environmental benefits — including carbon reductions.